Throughout history language has been powerful. Words shape ideas, and the words that a group of people choose to coin and use not only reveal their world view, but also form it. By looking at the language of London’s common folk of past centuries, we can learn a lot about the lives they lived, as well as their attitudes towards them. 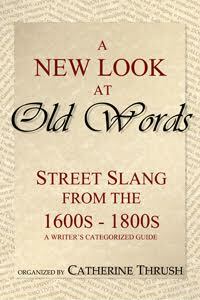 In 1860 John Camden Hotten published a dictionary of modern street slang in use in London. The subject was cant language and slang, both used by the underclasses of society at the time, but for very different purposes. Cant was a secret language, originally developed by Gypsies and thieves to communicate in front of the uninitiated without being understood. It must have proved a useful tool for the masses when dealing with the upper echelons of society, who often had undue power over them. A pair of accused thieves could get their stories straight in front of a policeman who would be none the wiser, or two costermongers could discuss how to fleece a “gent” of a few extra shillings in his presence. Cant was very like code. In fact, vagabonds and beggars developed a symbolic code that they scratched onto buildings and fences to let others of their kind know what sort of treatment they received at a certain place. Bone for example, was cant for good or excellent. The symbol ◊, the vagabond’s hieroglyphic for bone, or good, was chalked on houses and street corners as a hint to beggars who came after them. Cant, therefore, was ancient and slow to change, passing from generation to generation. Slang, in contrast, is always modern, ever evolving, changing with fashion and taste. Slang demonstrates that a person is “in” or current with pop culture, or identifies the speaker as part of a group. Every social group had and has its own slang. Street slang is arguably the most colorful and the street slang of London from the 1600s to the 1800s displays the delightful sense of humor and whimsy of the “lower orders” as John Camden Hotten called them. They may not have had much money or education, but the poor folk of London had a brilliant knack for descriptive and playful language. How could anyone not be charmed by such terms as dumpling depot for a stomach or painted peeper for a black eye? Dimber damber, meaning very pretty or chief of a gang, rolls off the tongue pleasingly. They were no strangers to sarcasm either. If they couldn’t afford mutton or duck for dinner, they called their sheep’s feet legs of mutton and their baked sheep’s head Field Lane duck, after the poor neighborhood Field Lane. Often their feelings toward politics and the upper classes showed in the words they coined. Glasgow Magistrates for example was a slang term for salt herrings. One can’t help but wonder what the magistrates of that fair city did to deserve to be compared to dead fish. 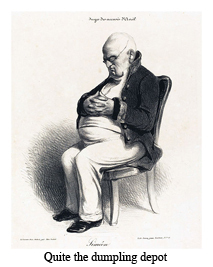 The slang phrase drunk as a lord was a common saying, probably referring to a rich man’s ability to afford such gratification and a sly sarcasm at the supposed habits of the upper class. 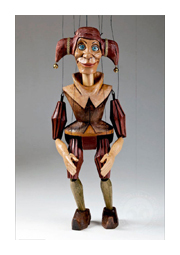 And even today we can appreciate the term quockerwodger which was the proper term for a wooden toy figure, which, when pulled by a string, jerked its limbs about. In a slang sense it signified a pseudo-politician, one whose strings were pulled by someone else. The street purveyors of slang even faced illness and death with a lively sense of humor. Someone on their last legs was a croaker and once gone they became a stiff ‘un. Their word for a stomach ache, mollygrubs or mulligrubs is particularly interesting because it also meant sorrow. They believed that the stomach was the seat of emotions, not the brain. A belief rooted no doubt in their experience of emotions and not the emerging science of the times. The term maggoty meant fanciful or fidgetty. Whims and fancies were termed maggots from the popular belief that a maggot in the brain was the cause of any odd notion a person might exhibit. While many of the slang words were charming and fun, some show us the darker side of life for the poor in those years. Some honest people were forced to do horrible things to make ends meet. 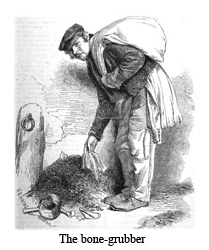 Pure-finders collected dog dung and bone-grubbers hunted dust-holes and gutters for refuse bones to sell. Some beggars employed the “scaldrum dodge” burning their bodies with a mixture of acids and gunpowder, in order to look disabled and collect more sympathy and alms. Perhaps the saddest were the mud-larks, men and women who tucked their clothing above their knees and groveled through the mud on the banks of the Thames when the tide was low for silver spoons, pieces of iron, coal, or anything of value deposited by either passing ships or the sewers. The term drips with irony considering that a lark meant a bit of fun or entertainment. It’s no wonder so many people turned to crime to make a living. Even here we see the whimsical as well as the darker side. On the lighter side, lully priggers were rogues who stole wet clothes hung on lines to dry, and cat and kitten sneaking meant stealing pint and quart pots from public-houses. Such activities must have happened on a fairly regular basis to earn their own slang names. On the dark side, a wind-stopper was a murderer who garroted his victims and to burke someone was to murder them by foul means. 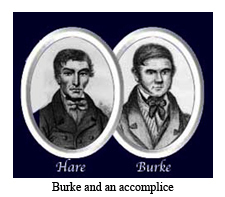 The term came from a man by the name of Burke, a notorious murderer, who waylaid people, killed them, and sold their bodies for dissection at the hospitals. It doesn’t get much darker than that. If their language is any indication, violence was a part of everyday life. John Camden Hotten’s dictionary included eighty-eight words for striking or beating someone or something. That’s more than any other category in the book. Plus there’s another thirty-two words for getting the better of someone. It’s easy to see what was on people’s minds. If language is indicative of world view, then the common folk, the street sellers, small shop owners, street urchins, Gypsies and thieves of London maintained their senses of humor despite the reality of violence and inequity in their lives. They faced circumstances of privation and hardship with sarcasm and wit. I wonder if the same will be said of our language in years to come. A New Look at Old Words is a writer’s and word-lover’s categorized guide to the slang of pirates, street-sellers, Gypsies, thieves and more. Now find the perfect slang word to spice up the language and dialog of your work in progress. Based on A Dictionary of Modern Slang, Cant, and Vulgar Words written by John Camden Hotten in 1860. Visit the Kickstarter for more info on A New Look at Old Words. Catherine Thrush is a San Jose, Ca based historical fiction writer and the organizer, designer and illustrator of A New Look at Old Words. 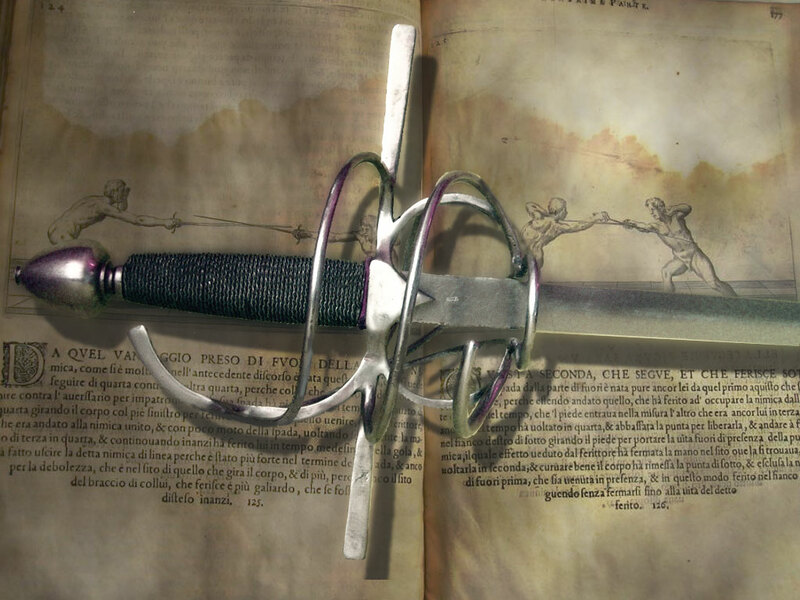 Her historical fiction novel Lady Blade will be coming soon.